Because it’s a slow day, in the sense that I have more to do than time in which to do it, and thus blogging has slipped way down my list (below getting something to eat, which won’t happen for a while either /tummy rumble). And because this is intriguing, and because I’m sure there are plenty of you blogginators and proto-blogginators out there who have thought it would be nice to make the odd few bucks while doing — or writing about — something we love and are passionate about. Go check it out! Spearhead wants WAR (and post-WAR, if not (too) bitter and twisted) bloggers for something we don’t know what it is and if he told us, he’d have to kill us. How can you resist? 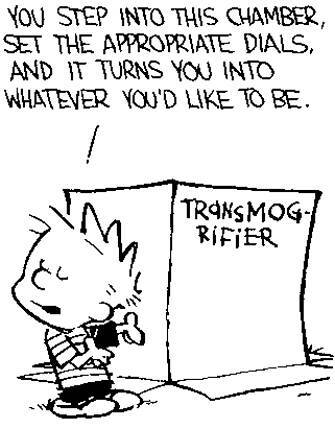 It’s like Calvin’s transmogrifier! And finally, because a little Calvin and Hobbes on a bad day (or even a good one) is bound to make it that little bit better. I can has coffee nao? Ewww. A Transmogrifier! Spy-team assigned! Conspiracies eVeRywheRe! Thank you for the plug Ysharros!